Good Migrations! Birds flock to Fairbanks for summer. Honking overhead and sweet songs at the break of dawn can only mean one thing - It&apos;s Springtime in Fairbanks, Alaska! In the Spring, Fairbanks becomes a birder&apos;s paradise thanks to migratory routes, diverse habitats and still wild lands. Birding enthusiasts, animal photographers and nature buffs delight in spending time in Interior Alaska during the spring and fall because of the abundance of wildlife, either waking up from winter or moving in from "snowbirding" down south. Whether you visit the boreal forests, frozen tundra or local parks, there are birding opportunities abound! 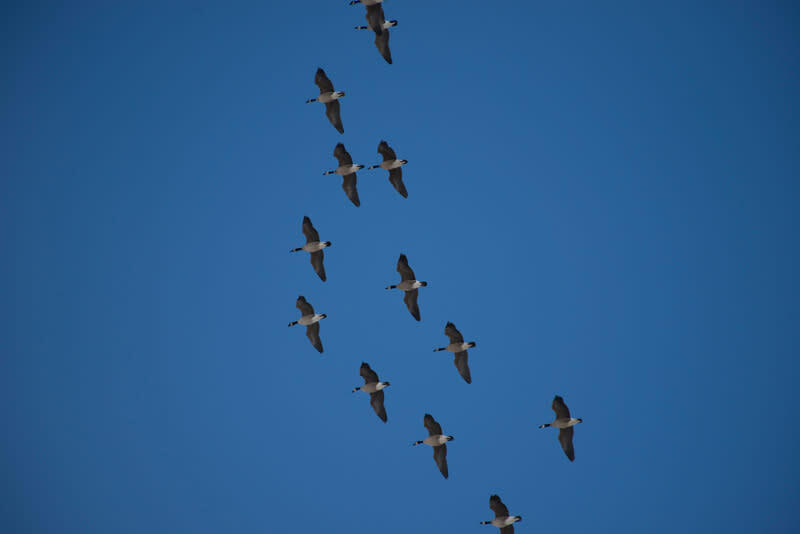 Below is a short guide to popular events and accessible hotspots to check out the wonders of these birds&apos; yearly migration. 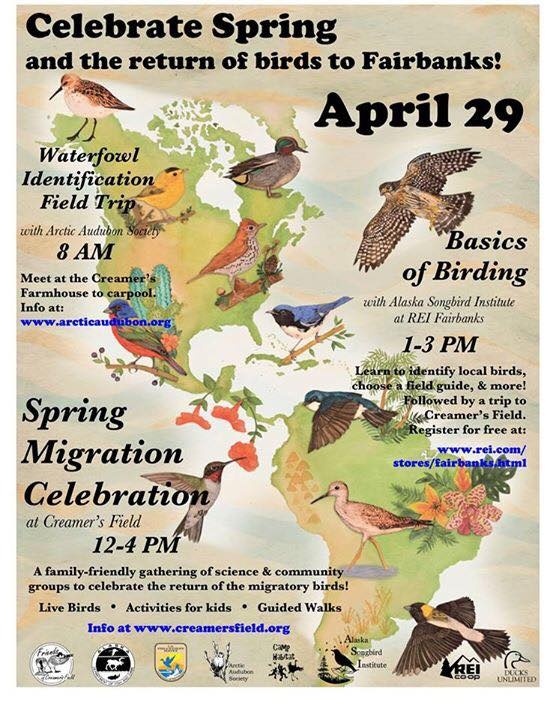 This much anticipated annual celebration of spring migration at Creamer&apos;s Field Migratory Waterfowl Refuge is a local favorite. Scheduled to coincide with the peak of bird migration, the program consists of bird and wildlife viewing, information booths of local conservation organizations, nature walks, and activities for the whole family such as puppet shows, crafts, and games. This free event is cooperatively presented by Friends of Creamer&apos;s Field, Alaska Department of Fish and Game, the Arctic Audubon Society, REI, the Alaska Songbird Institute, the Alaska Public Lands Information Center, Ducks Unlimited, and the US Fish & Wildlife Service. View their flyer about the event or call 907-459-7301 for more information. Close to town and easy to get to, Creamer’s is a hotspot for birds during spring and fall migration as well as during the breeding season. If shorebirds come through Fairbanks during spring migration, this is one of the best places to see them. The front and backfields are good places to watch waterfowl, swans, cranes and geese. Canada geese are the first to arrive typically, followed by trumpeter swans - North America’s biggest, and perhaps most recognizable, species of waterfowl. The trails are good for songbirds and forest raptors such as goshawk and sharp-shinned hawk. Look around on the fence poles along the trails in the front field, you&apos;ll see tree swallows speeding in and out of the many nesting boxes. A good tip is to wear break-up boots as the trails can get pretty mucky during spring break up! Waiting for the birds to arrive in early April at Creamer&apos;s Field. These front fields will teem with birds by the end of the month! With lakes, shorelines, shrubs and forests, this site is particularly good for shorebirds in spring. Waterfowl, arctic terns and songbirds, including yellow-rumped warblers and ruby-crowned kinglets, are spotted along the shorelines and trails. Parking is located in the lot on the South Cushman side. 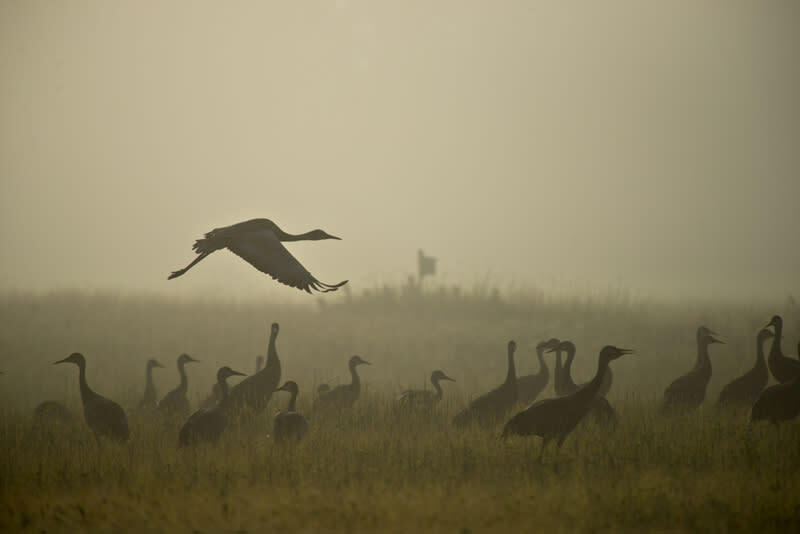 Click here to view an informative guide to birding at Tanana Lakes. 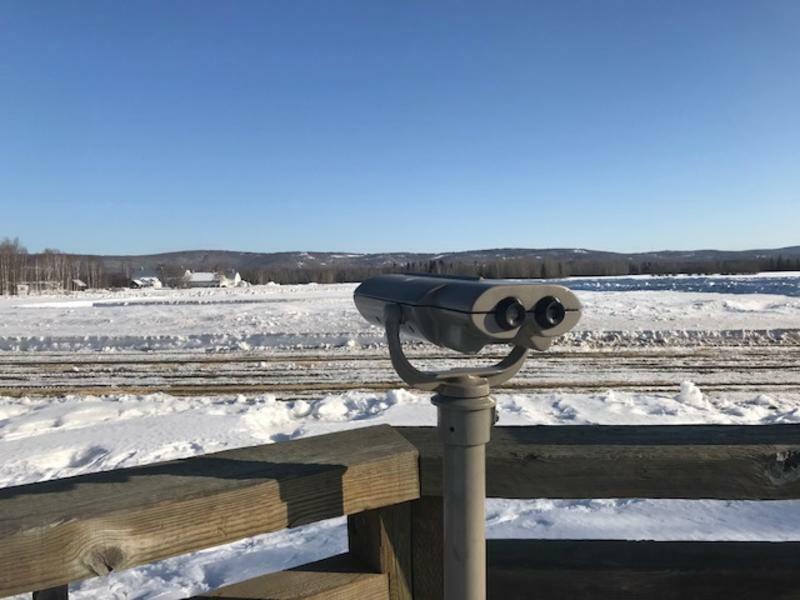 According to the Fairbanks North Star Borough Parks & Rec Department, there are three main bird-viewing areas on the UAF campus. The agricultural fields on the south side of campus provide a stopover site for migrating waterfowl, cranes and shorebirds. The UAF ski trail system is wonderful for walking and takes you through boreal forest and wetlands. Take the trail to Smith Lake to look for nesting waterfowl, shorebirds and songbirds. View a map of summer trails here. The Peat Ponds is a small, newly developed community park located near the intersection of Murphy Dome and Goldstream Roads. Alaska Songbird Institute reports that they are particularly birdy during spring and fall migration, where you will find many waterfowl species, as well as grebes and maybe a belted kingfisher will show up. Shorebirds use the ponds regularly during spring migration. Lesser yellowlegs nest in the area and they will call all summer long. Bonaparte’s gulls nest around the perimeter of the ponds in the black spruce and are fun to watch as they defend their nests against other gulls. This is the only place in the Interior to see nesting red-winged blackbirds, too! There are usually one or two pairs mixed in with the rusty blackbirds. This place is loaded with white-crowned sparrows and ruby-crowned kinglets and flush with with dragonflies, moths and butterflies during the summer. The Alaska Songbird Institute clued us into this one. Grab your binoculars and some snacks and head north. A two-hour drive along the Steese Highway will get you in high tundra habitat where you will see a suite of birds not likely seen other places in the Interior. The best time to go is in June. 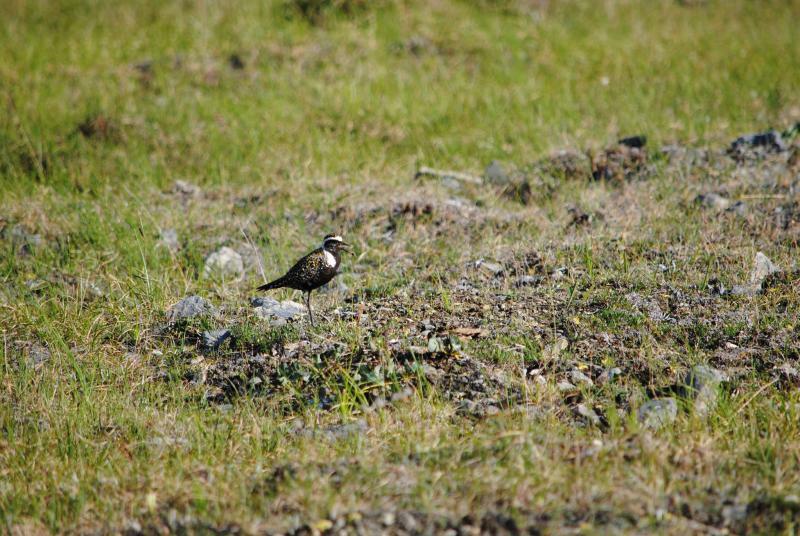 American golden plovers, horned larks, wheatears and lapland longspurs all nest here. If you’re lucky, you might see long-tailed jaegers or even surfbirds. In Fairbanks, we love how our population swells with feathered friends each year in the springtime! 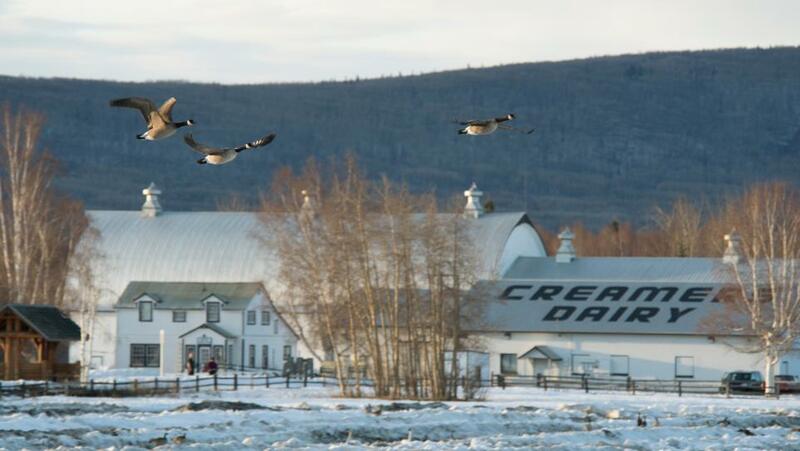 Whether you&apos;re looking for a bird to knock off your life list, casually viewing them in their natural habitat or just like being outside in nature, Fairbanks has many great options for families, travelers and locals. Pssst...if you missed migration this year, but might want to come next year - the birds WILL be back! Request a free guide book here to help with your planning. Just don&apos;t forget your binoculars!